Friendship Circle is an organization that services San Diego county. They focus with helping individuals with special needs to socialize. Many special needs individuals suffer from not having friends as well as they have a hard time socializing because of their conditions. Friendship Circle, helps these kind of individuals by providing social activities. 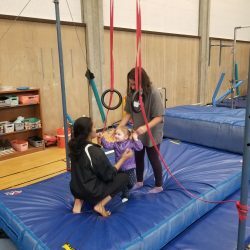 For instance, they hold gymnastics classes to help kids, teens, and adults with social needs to get out of their comfort zone. Thus, they are able to talk and experience new activities that they would normally wouldn’t do. Then they would begin to interact with other individuals without the fear of being judged and criticize. Friendship circle creates a safe space to many special needs families to socialize and to spend a great time with their family and friends. Jump, climb and play with other little ones on the spectrum. Every second Thursday from 6-8 p.m. head to Playwerx for fun and food. Further, meet other families with kids on the spectrum. Secondly, enjoy an evening free of judgment. There are tables for parents to sit and talk while they watch the crew. Cost: $8/child; plus there is a snack bar. Clippity-Clop! Let your littles brush the soft hair of a horse and learn to get-up and sit on its back. Your little rider may let out a quiet, “giddy-up” while learning to direct and ride the horse. You may say a little “yee-ha” at your child’s developing balance and hand-eye coordination. If you live in North County, sign-up for the six-week therapeutic riding lessons at Ivey Ranch Park. In the La Mesa area, Partners Therapeutic Horsemanship works with special needs riders. And in Rancho Santa Fe, Helen Woodward Center Animal Center teaches autistic kids to ride. 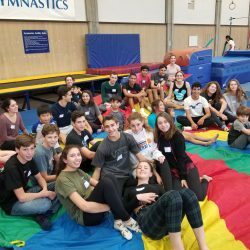 This special evening is an opportunity for kids and their parents, siblings and caretakers to have some fun in an autism-friendly environment along with other families. Many of the museum’s community partners, who specialize in supporting children on the autism spectrum, will be on-hand to enrich your family’s play experience with welcoming smiles and practical support. Hours: Last Monday of the month, 5-7:30 p.m.
Feel the Nat’s welcome on ASD mornings. Let your littles explore a quiet, more manageable museum an hour early. Walk with the dinosaurs, settle back and see the Ocean Oasis film, shown with the lights turned-up and the sound turned-down. Relax in a theater with less people and more room. Wander downstairs to see the habitats of Southern California, or explore the Coast to Cactus exhibit (complete with RV and camping). Join other autistic families at this early exploratory hour. Need a little silence? A room is provided — away from the event —to recharge. Insider’s Tip: You need to call ahead and reserve a spot. Cost: $19.95/adult; $11.95/youth (3-17); Children two and under are free. Get ready to explore! The first Sunday of the month from 9-10 a.m is sensory-friendly. Wake-up and investigate the museum with special activities geared for those on the spectrum. Also good to know that during sensory-friendly mornings the museum offers a designated quiet space located in the indoor classroom. Even more, you’ll get family time in an accepting setting. Also, after 2 p.m. daily this museum has quiet times. It’s time to get hands-on at your local library. On the first Sunday of the month, the La Mesa Library opens an hour early (11 a.m.) for this tactile event. Little learners get to touch and play and engage in friendly-play. Truly the best part is you can make noise and move about! Nothing says nurture like the San Diego Botanic Garden in Encinitas. Tots can walk through a kid-sized garden house, say a little choo-choo at the outdoor train village, or dig a ditch in the dinosaur playground (all found at the Seeds of Wonder). Bigger explorers can traverse to the treetops, play with petite boats in the creek, or join a garden game of tic-tac-toe (all found in the Hamilton Children’s Garden). We love the fact that nature is grounding and calming. Future scientists will feel at ease when the Science Center opens its doors one hour early for families of autistic kids to tinker, discover and think. Catch the first IMAX film screening that runs with more lighting and lower sound. Little inventors can pull levers and turn knobs moving balls down a wall, shop for groceries, or experiment with air. Bigger kids can build a skyscraper; learn about cells, electricity, and tornadoes, all in a comfortable environment that’s creative and fun. If things get too exciting, a calm cool-off space will be available. Hours: 3rd Saturday of the month, 9 a.m. (an hour before opening); IMAX showing at 10 a.m. Swim around a saltwater pool at this monthly indoor swim party. Perfect pool temperature paired with free family fun, complete with pizza, drinks and lifeguards. Hours: 2nd Friday of the month, 6–8 p.m.
Don’t forget to add Amazon Smile!